Today, Canada is a major player in the mining sector - a world leader in financing the industry, a leader in exploration, and one of the world�s largest producers and exporters of metals. It was not always this way. At the turn of the 20th century, the Canadian mining industry was small, with many companies under British or U.S. ownership. 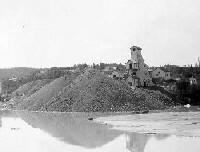 The nickel mines of Sudbury had been operating since the late 1880s, but many believed that, otherwise, northern Ontario was devoid of mineral resources. So what changed? How did Canada go from a minor player with a largely foreign-owned mining industry, to a world leader? The answer to that is complex, but the starting point to answer that question is clear - COBALT!! In 1902 the Ontario government decided to build a railway from North Bay to the small farming communities of Haileybury and New Liskeard on the shores of Lake Temiskaming. By the summer of 1903, the railway was reaching a point 103 miles from North Bay. Legend has it that one evening that summer, Fred LaRose, a blacksmith working on the construction of the railway, was in his tent when he saw a fox outside. LaRose grabbed his hammer and threw it at the fox. He missed, and the hammer clanged against a rock face. In the morning LaRose picked up his hammer, and discovered that when he had thrown it, it had chipped away some of the rock and exposed a silver vein. The Cobalt silver camp had been born. The true stories of the discovery of silver around the Mile 103 section of the railway are not as romantic as the legend, but by the time of the first snow in November of 1903 word of the discovery had spread. By 1905 there were sixteen mines in the area, and in 1911 production exceeded 30,000,000 ounces. 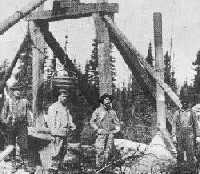 Cobalt was the biggest silver mining camp in the world and was known by everyone in North America who ever picked up a newspaper. Mining continued until the 1930's, then slowed to a trickle. Activity renewed in the 1950's then slowly dropped off, and there are no longer any operating mines in the area. The silver mines of Cobalt, and the prospectors and miners that discovered them and worked the mines, have left an indelible mark on Canadian history. The discoveries at Cobalt led the way to further exploration, mining and settlement in northern Ontario and Quebec. 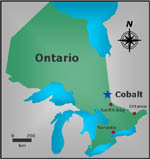 Cobalt was a training ground, the birthplace of hardrock mining in Canada. 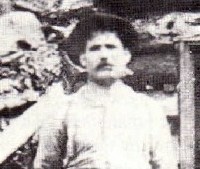 The ore was close to surface, which meant that men with limited experience could prospect and begin mining, and then hone their skills as the mines went deeper. Those who learned their trade in Cobalt moved north, discovering gold in Kirkland Lake and Timmins and further afield in Canada and around the world. Indeed, Cobalt remains a training ground, with the Carleton University Institute of Environmental Science holding an undergraduate field camp there late each summer. The discoveries in Cobalt also generated considerable profits for the mining companies and royalties for the provincial government. In the book �Harvest from the Rock� Philip Smith wrote that �It was at Cobalt that Canadian financiers overcame their traditional reluctance to invest in mines, and the money that they made there encouraged them to finance the great expansion of mining that would occur in Ontario over the next half-century�. The historical importance of Cobalt is recognized and kept alive in many ways. In 2001, Cobalt was named �Ontario�s Most Historic Town� by TVOntario, and in 2002 the area was declared a National Historic Site. In 2003, the Royal Canadian Mint even struck a special commemorative silver dollar to mark the 100th anniversary of the discovery of silver in Cobalt. Visitors to Cobalt can go to the Cobalt Mining Museum, which boasts one of the largest collections of silver in the world, and follow the Heritage Silver Trail to several mine sites in the area. In addition to this important historical legacy, the mining activities in Cobalt have also left an environmental legacy. 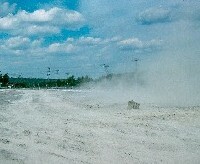 Millions of tons of mine waste rock and mill tailings were dumped on the land and in local lakes. In Cobalt ores, silver was associated with arsenic minerals. Little of this arsenic was ever recovered - most of it ended up in the tailings and waste rock. Today this arsenic contaminates surface water in the area and poses risks to the environment and human health. The Cobalt area is also laced with many miles of underground mine workings, as well as surface trenches, pits and shaft openings. As a result, there are risks of collapse, or subsidence of underground mine workings, and many areas that have been fenced off to prevent people from entering mine workings. These mine hazards are another aspect of the legacy of mining in Cobalt. The goal of this website is to tell the story of Cobalt�s legacy - both the historical legacy and the environmental legacy. There are other sites that tell the story of Cobalt�s historical legacy - this site complements those sites and links to them, helping to tell this important story and encourage people to visit Cobalt. Telling the story of the environmental legacy of Cobalt will help raise the awareness of the environmental problems in the Cobalt area. In addition, the site also serves as a clearing house for information related to past environmental research in the Cobalt area. It is hoped that this will help to foster further research and monitoring in the area and, ultimately, an environmental clean-up in the area. A clean-up that reduces the risks to the environment and human health, while respecting the heritage and historical legacy of Cobalt. 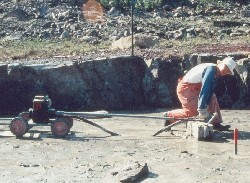 The author of this site, Charles Dumaresq, is a geologist who first visited Cobalt in 1986 for a Carleton University Geology Department field camp. In 1991 and 1992 he carried out environmental research in the area as part of his graduate work at Carleton. From 1993 to 1997, Charles continued working in the Cobalt area, with colleagues from Natural Resources Canada. In January 2006, Charles began participating, as a scientific advisor, on the Cobalt Soils Study Steering Committee. Charles works for Environment Canada, and while Cobalt is a personal interest and not part of his responsibilities with Environment Canada, he continues to work on issues related to mining and the environment. He participates in the Mine Environment Neutral Drainage (MEND) program and the National Orphaned and Abandoned Mines Initiative (NOAMI), and is involved in the preparation of an environmental code of practice for metal mining. His group is also responsible for Canada�s Metal Mining Effluent Regulations, which regulate the quality of waste water discharged from Canadian metal mines. Charles is also an amateur historian, with great interest in Canadian history. Thus, this site represents a convergence of his passions - mining, the environment, and history.